This is the second in a series analyzing historian Richard Hofstadter’s 1969 book, The Idea of a Party System. During a period when progressives’ frustration with the Democratic Party seeks constructive resolution, it is worth looking at the historical evolution of parties under the leadership of the Founders, whose very fears about political parties quickly became reality. 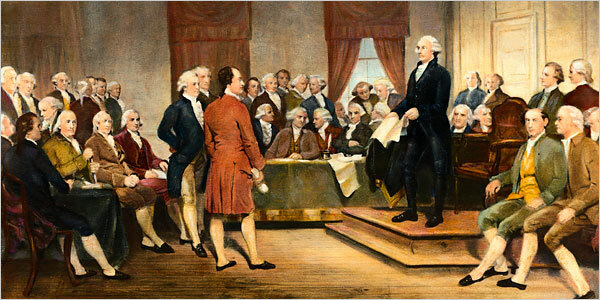 In creating a government that would balance liberty and stability, the Founders were fairly unified in their belief that checks on government power should be built into the Constitution, rather than established through the volatile political process. The Founders, explains Hofstadter, did not expect permanent political parties to play a significant role governance, but did want to establish checks to limit a faction’s potential power. These checks include the three separate branches of government, the bicameral legislature, freedom of the press, and so on. In Federalist 51, Madison argued that the diffusion of sects and interests in the United States would prevent one sect from exerting majority rule, both in religious and civil life. Read in concert with Federalist 10, in which he argued counter-intuitively that a large, extensive representative republic would be best equipped to prevent majoritarian tyranny, Madison banks on the notion that while factions would arise, under the Constitution they would not be able to garner sufficient support to establish lasting majority power. Having previously observed a host of small parties, working independently in their various states, Madison did not foresee the creation of two major parties, which was catalyzed by the national debate over the Constitution. It is true to this day that there are many competing sects and ideologies in American politics. Every election cycle witnesses primary battles along lines of social and economic liberalism (or conservatism), the role of libertarianism, religion, environmentalism, energy production, urban interests, the influence of corporate power and labor unions. Instead of all exerting their influence as distinct and weak individual factions, however, they debate within the framework of the Democratic and Republican parties. The utility of having these grand formations, these ‘big tents’, makes sense in retrospect. But how did they come to be, and how did the first majority party, the Republicans, emerge under the leadership of James Madison himself? In the early 1790s, as anti-Federalists increasingly coalesced into Jefferson and Madison’s Republican Party, Madison began to view the role of parties in the constitutional framework differently. He now saw political parties as checks on each other, having conceded their existence in the political system. He considered the governing Federalists “more partial to the opulent than to the other classes of society” and governing through “the influence of money and emoluments and the terror of military force”(p.82), while his oppositional party represented the common good. Madison’s perspective, which progressives often tout today, is that the views of his party were in line with the majority of the people, but the Federalists, “being the weaker in numbers, would try to strengthen itself with the influential, particularly the moneyed men, the most active and insinuating influence”(p.83). Madison warned that a minority party, bolstered by money, would work to unravel a majority coalition through exploiting prejudices and distracting the public from matters of primary concern. In fact, Madison’s essays in the early 1790s abandoned his Federalist Paper-era concern with majority rule, and now turned to the pernicious ability of political parties to run the nation from the minority position. Anyone who has lived through the last two years can relate to that. One character we’ve yet to come across in this discussion in George Washington. He suffered terribly though these years, after thinking his near-unanimous election in 1788 was a mandate for non-partisanship. He had attempted to keep a balanced cabinet, but with the departures of Secretary of State Jefferson and Attorney General Edmund Randolph, by his second term the team was decidedly Hamiltonian, and Republican forces around the country no longer considered him off-limits politically. In response, Washington blasted Republicans for fomenting the Whiskey Rebellion and trying to sink the Jay Treaty, and dangerously walked the line tying political opposition to sedition. As Hofstadter explained, the American system could only work if both the ruling party and the opposition recognized each other’s legitimacy, and by the mid-1790s, this was breaking down. In fact, Washington’s much-praised Farewell Address, written by Alexander Hamilton, was considered then a slap-down of the Republican Party. Washington’s denouncement of factions implicates the Jeffersonian opposition, but he considered himself “a man above party”. He cautioned people to “steadily discountenance irregular oppositions to the acknowledged authority of government”(p.98). Failing to define “irregular opposition”, Washington was essentially telling the American people that his people running the government should not be undermined by a pernicious opposition, hardly the “let’s all get along” ethos the speech is remembered for. Thank you for reading. On Saturday I’ll post Part III: The Adams Administration. This entry was posted in Uncategorized and tagged Founding Fathers, Richard Hofstadter. Bookmark the permalink.